Botcon have updated their Facebook page with in-hand images of the Botcon 2013 Obsidian. In-hand, Obsidian looks a little more grey than the deeper almost blue shade he was shown as previously, which makes the red highlights all the more striking. Check out the images and see what you think. Botcon 2013 takes place over the weekend of 27-30 June 2013. Pre-registration closes on next Tuesday 11 June 2013 - head on over to Botcon.com to find out more! We also have a preview for the next chapter of Transformers Regeneration 1! In this issue, Cybertron is in crisis following Scorponok's assault! Shockwave plots and as if this was not enough, the beleaguered Autobots must face off against a new, deadly incarnation of the Mayhem Attack Squad! It's all going down in the next instalment of Transformers Regeneration 1, hitting comic stores everywhere next Wednesday, 12 June! IDW has released the previews of the Transformers comics being released this coming Wednesday, 12 June, and first up we have a preview of Transformers Prime Beast Hunters #2 which resolves a long-hanging plot point from War for Cybertron concerning the Dinobot Sludge! Check out the preview attached to this story, and be sure to pick up the full issue, in store Wednesday! ComicBookMovie has posted some new set photos from Transformers 4. The images feature recently revealed Lamborghini Aventador LP 700-4 Coupe with the Rusty Cab-Over Truck in Pflugerville, TX. Interestingly, there are some images of old vehicle modes of Movie Optimus Prime and Bumblebee being transported. One Instagram image reveals the location as “I-10 outside of LA” while another taken outside Paramount Studios. Yesterday's all-new episode of Transformers Prime Beast Hunters, Thirst, saw the return of Breakdown as subverted by the human villain and MECH leader Silas. CyLAS or Silas Breakdown as he is known combines Breakdown's mechanical might with Silas' cunning tactical mind - though as you might have seen in Thirst, there was a bit more going on there too. Transformers Prime Arms Micron Silas Breakdown was a Japan exclusive release, and the third outing for the Japan-only Voyager Class Prime Breakdown mold after War Breakdown and Autobot Swerve. For this release, the mold was redecoed in black, with a new head tooling and a chromed bumper. It is not really show accurate (in the show, CyLAS deco was a more worn version of Breakdown's, with no bumper) but it is a very pleasing and dynamic deco all the same. In a nice touch, the sticker sheet comes with a lot of extra optional stickers including ones to represent battle damage and scarring on the metal armor, allowing you to customize your Silas Breakdown with scarred armor, or as I have done with mine keep his black body unmarked and "clean". Another nice touch is the inclusion of a remolded portion of the stomach area to incorporate a molded human Silas wired into Breakdown, as seen in the cartoon. Silas Breakdown's Arms Micron partner is a preying mantis, Magi, which transforms into a claw weapon. Again it is not based on a weapon that Silas or Breakdown ever used in the show to my knowledge, but the style of it fits Silas, his background and his fighting style perfectly. Overall, Silas Breakdown is a fantastic release. The additional sticker details allow for a full range of customization, and the base toy is one of the best developed for the Transformers Prime line - more the pity, then, that it never made it to markets outside of Japan. Ever the leading man of the Autobot forces, Optimus Prime is the flagship of the Transformers brand. The iconic Autobot leader has been the recipient of many toys across the years, and tonight we are going to highlight another of the major high-end ones - the Masterpiece Optimus Prime, released late last year by Hasbro. Masterpiece Optimus Prime is the domestic release of Takara-Tomy's MP-10 Convoy Version 2. He's not to be confused with the 20th Anniversary Optimus Prime, which is sometimes referred to as Masterpiece Optimus Prime in fan circles. The US version of the MP-10 mold is a triumph through and through - it includes everything from the Japanese release right down to the trailer and the Spike minifigure, plus it has what some consider to be the superior paint job particularly with regards to the eyes. It's a fantastic release truly worthy of the name "Masterpiece". Really, this is one release words cannot do justice to. So open the link below to view TFW2005 site owner Tony_Bacala's gallery of Masterpiece Optimus Prime and see for yourself! Botcon has shared via their Facebook page some in-hand images of the 2013 exclusive, Machine Wars "Teleporting" Skywarp. The Revenge of the Fallen Dirge remold comes with a new head, translucent purple elements and a whole lot of white on his design - check out the images attached to this story. TFYuki has tweeted some new images of the upcoming Takara-Tomy release of Transformers Generations Fall of Cybertron Grimlock. The Takara-Tomy Grimlock features some nice shiny gold paint on the torso area, as well as a red lower torso and other additional paint applications, mostly geared at adding extra details and playing up a Generation 1 styled paint job. He is due out later this month, along with Generations Senator Ratbat and the Transformers Go! Samurai team. Zicoyu of TFG2 dropped us a line to share this link with us, showing off an interesting little unofficial custom Transformers item. We're not clear on if this is a full-on Third Party release or a garage kit, but you can see from the pictures that it is a great, and small, version of the Fall of Cybertron Swoop pterodactyl. Zicoyu informs us that this Swoop, rather than assuming a robot form, can transform into a cassette tape mode that can fit inside Masterpiece Soundwave. Watch this space for more news on this and other unofficial third party releases. By way of the Weibo page of Find me Guilty we have a look at their next release, an accessory set for Fall of Cybertron Starscream. The set gives Starscream a crown based off his 1986 Transformers movie (which he can get and wear as an Easter Egg in Transformers Fall of Cybertron) along with a Nucleon Charge Rifle also from the Fall of Cybertron game. We should make you aware though that in addition to not being licensed by Hasbro, this release also seems to have been copied from Fakebusker's Shapeways store, potentially without their permission. With the announcement of the SDCC Exclusive GI Joe vs Transformers Hound & Jetfire set, we thought it might be a good time to take a look at one of the characters from that set. We've already posted auctions for Hound, so now we're going to take a look at the other main guy...Jetfire. Check out some of the many toys to bear the name below. Zap2it have now updated their TV listings page with a one-line synopsis of the episode Minus One. This synopsis seems to imply whose side the "minus one" falls on, along with raising the possibility of some interesting character interactions. The Autobots question a captured enemy for information regarding Megatron's plans. Michael Bay's website has updated with a fresh Transformers 4 update. Joining the lineup of vehicles in Transformers 4 is the sleek 2013 Lamborghini Aventador LP 700-4 Coupe. No word as yet on which Transformer this will be (or if it will even be a Transformer) but it seems likely. Keep it TFW for more information as it comes to light. They're big, they're bad, and they want to drink your Energon! Meet the Decepti-zombies, the antagonistic force that are giving Starscream and Knock Out their very own zombie apocalypse story in tonight's all-new episode of Transformers Prime Beast Hunters, Thirst. These promo stills via the Transformers Facebook page and BCKids show what happens when deactivated Vehicons return with an unquenchable thirst for the fluids of the living! Tune in to Hub Network tonight at 7:30pm ET to see how Starscream and Knock Out get themselves out of this one alive! War For Cybertron Omega Supreme is on the hunt and will be landing at NJCC on August 18th, 2013 thanks to our official show sponsor www.RobotKingdom.com. The Planet X – PX-01 GENESIS is one bad robot! 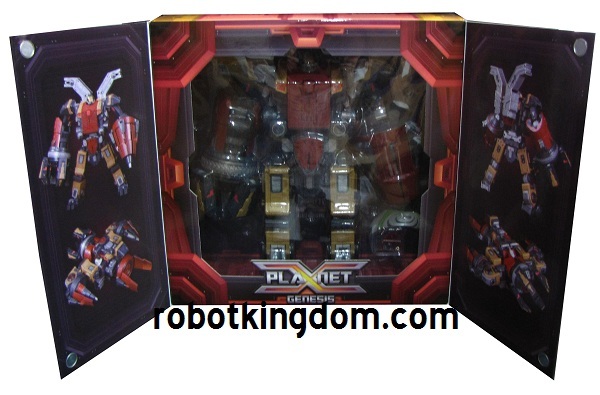 Make sure to check out RobotKingdom.com where Planet X - PX-01 GENESIS is instock and ready to ship! Takara-Tomy designed Shogo Hasui has tweeted a side-by-side comparison image of the upcoming Masterpiece Tiger Track and Masterpiece Sideswipe. Tiger Track will feature a unique head mold, after a fashion - his head will combine the face tooling from Masterpiece Red Alert with the helmet tooling from Sideswipe, for a unique look all of his own. Takara-Tomy's Masterpiece Tiger Track will be a Tokyo Toy Show exclusive, available at the show over the weekend of 15-16 June 2013. Big Masterpiece news is promised from the show which we expect will be the reveal of Masterpiece Smokescreen - keep it TFW for more updates! Hisashi Yuki has tweeted some new images of the upcoming Japanese Generations Ratbat. Presently set to only be released in Japan, Ratbat is a retool of the Generations Scourge with a new head and a killer purple paint job with a really nice sheen to it - check out these images and see for yourself! He's out at the end of the month along with the Japanese Generations Grimlock and Transformers Go! Samurai team, making this potentially an expensive month for the Transformers fan with a taste for imported awesome. Botcon have updated their Facebook with final in-hand images of Strika, from the Botcon 2013 Machine Wars boxed set. These new images show the new head on Strika as well as the final deco. Check out the images at the link above or attached to this story. The Idle Hands; a blog by Paul Nicholasi is revealing some sweet details from the book Transformers: The Covenant Of Primus; a book based on the Transformers Aligned Continuity. "The Covenant of Primus is the definitive in-world history of the Transformers. For the first time, it reveals the stories of the Thirteen Primes, the original Transformers. The narrative will also cover the golden age of Transformer civilization, the war between Optimus Prime and Megatron, and finally the present day on Earth. Sixty never-before-seen illustrations, 20 commissioned just for this book, bring these epic events to life. The hardcover book will be housed in a custom case shaped like the Autobot emblem. The classic mechanical “transforming” sound is triggered when the reader pulls open the three segments of the case." The Covenant Of Primus is written by Justina Robson with Original Illustrations by Ken Christiansen, Casey Coller, Livio Ramondelli and Emiliano Santalucia (some of our good friends at TFW2005). The book is priced at $99 with 176 pages. The blog gives us a great preview of the book and some truly stunning artwork. Check it out at The Idle Hands.